O God, glory of your Priests, grant we pray, that, helped by the intercession of your Martyr Saint Fabian, we may make progress by communion in the faith and by worthy service. Through our Lord Jesus Christ, your Son, who lives and reigns with you in the unity of the Holy Spirit, one God, for ever and ever. Grant us, we pray, O Lord, a spirit of fortitude, so that, taught by the glorious example of your Martyr Saint Sebastian, we may learn to obey you rather than men. Through our Lord Jesus Christ, your Son, who lives and reigns with you in the unity of the Holy Spirit, one God, for ever and ever. St. Fabian and St. Sebastian have always been venerated together, and their names were coupled in the ancient martyrologies, as they are still in the Litany of Saints. St. Fabian was Pope from 236 to 250 AD. He promoted the consolidation and development of the Church. He divided Rome into seven diaconates for the purpose of extending aid to the poor. He was one of the first victims of the persecution of Decius, who considered him as a rival and personal enemy. St. Sebastian, a native of Milan, was an officer in Diocletian's imperial guard. He became a Christian and suffered martyrdom upon orders of the emperor. St. Fabian, a Roman, was as energetic as he was admired and respected. He was able to accomplish a great deal during his long pontificate. Escaping the persecution of Emperor Maximus Thrax, who had been assassinated, Fabian enjoyed peace in the Church under the reigns of succeeding emperors. One of St. Fabian's first acts was to reorganize the clergy of Rome to better serve the increasing flock. He is also credited with beautifying and enlarging the cemeteries. He ordered paintings to adorn the vaults, and he erected a church above the cemetery of Calixtus. The Church flourished under St. Fabian as a succession of emperors left the Christians to themselves. This peaceful time came to an abrupt end with the ascension of Emperor Decius. He was a cruel enemy and he decreed that all Christians were to deny Christ by openly worshipping pagan idols. The Church was to lose many followers, but more stood firm to suffer torture and even death. Certainly, one of the first was Pope Fabian. Arrested, he was thrown in prison and died at the hands of his brutal captors. He is buried in the cemetery of Calixtus. 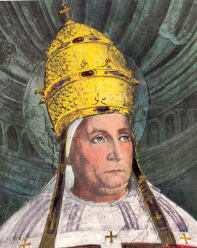 Pope Fabian's two special interests were the poor and the liturgy. Offer your Mass today for someone in spiritual need since this is the worst poverty and the greatest charity. The name of Sebastian is enveloped in a wreath of legends. The oldest historical account of the saint is found in a commentary on the psalms by St. Ambrose; the passage reads: "Allow me to propose to you the example of the holy martyr Sebastian. By birth he was a Milanese. Perhaps the persecutor of Christians had left Milan, or had not yet arrived, or had become momentarily more tolerant. Sebastian believed that here there was no opportunity for combat, or that it had already passed. So he went to Rome, the scene of bitter opposition arising from the Christians' zeal for the faith. There he suffered, there he gained the crown." St. Sebastian was widely venerated during the Middle Ages, particularly as a protector against the plague. Paul the Deacon relates that in 670 a great pestilence at Rome ceased when an altar was dedicated in his honor. The Breviary account of the saint is highly legendary; in part it reads: "Diocletian tried by every means to turn Sebastian from the faith of Christ. After all efforts had proven fruitless, he ordered him tied to a post and pierced with arrows. When everyone thought him dead, a devout woman named Irene arranged for his burial during the night; finding him still alive, she cared for him in her own house. After his recovery he appeared again before Diocletian and boldly rebuked him for his wickedness. Enraged by the saint's sharp words, the emperor ordered him scourged until he expired. His body was thrown into a sewer." Patron: Archers; armourers; arrowsmiths; athletes; bookbinders; diseased cattle; dying people; enemies of religion; fletchers; gardeners; iron mongers; lacemakers; laceworkers; lead workers; masons; plague; police; racquet makers; Rio de Janeiro; soldiers; Spanish police officers; stone masons; stonecutters. Symbols: Arrows of martyrdom; naked youth tied to a tree and shot with arrows; arrows; crown. Read a longer account of St. Sebastian's life. St. Sebastian's Day is marked in Sicily and in Kerala, India with huge celebrations. Try a Sicilian or Kerala dish for dinner tonight in honor of the saint. If you have an athlete in your family teach them the prayer to St. Sebastian.